I intended to write this blog in three parts. Before, during, and after harvest. That plan has failed, it turns out harvest is very tiring and you don’t really feel like writing after a long day running around a field hauling hops around. So, here I am writing part two after harvest and already it feels like it all happened a long time ago. It’s quite difficult to bring it all back, but one feeling sticks out about harvest. Just like that, harvest was done. I’ll go through our rough daily doings. First things first, breakfast. Life wouldn’t be complete without breakfast, everyone knows that. Rita, Brenda and Clair (who both gave up their holidays from their day jobs to help harvest) would head up to the workshop to pelletize the dried hops from the day before. This would take us through to about eleven, by that time the fog will have cleared and the dew on the bines would have dried, wet bines don’t harvest well at all. I was on the farm with fellow volunteer Paul, a total dude from Lithuania who can shred the guitar pretty damn well. Barry would give he and I a lift to the field on the back of his quad, whilst the dogs, Kobe (ko-bee) and Kuma (koo-ma) chased us. We’d hook the harvester up to the tractor and we’d start harvesting. We got into a pretty good habit of cutting down a trailer load of bines at the end of the day so that we could get straight to it the next day. Sure, a big breakfast and a few cups of coffee wakes you up, but the real wake up is when you hear the engine start up and the pickers start rolling and those cones start falling. It bought a smile to my face every time. If only there was a steam whistle to sound the start of the day’s work. That being said, we were right next to the Canadian Pacific Railway, a big train track founded in 1881 that goes all the way across Canada, hauling what I would refer to as ‘a sh*t ton of stuff’. All day you could hear the train horns echoing through the valley from a mile away. I tried writing about how the harvester works, but it was complex and long-winded. Then I wrote about how the harvester works but in the style of the ‘dem bones’ song. You know the one, “the hip bone’s connected to the leg bone”, but that didn’t really explain the process very well. So here’s a link that will demonstrate, in full, how the harvester works and how you could build one yourself, should you have the urge to build a prototype mobile hop harvester. The internet is an incredible feat. 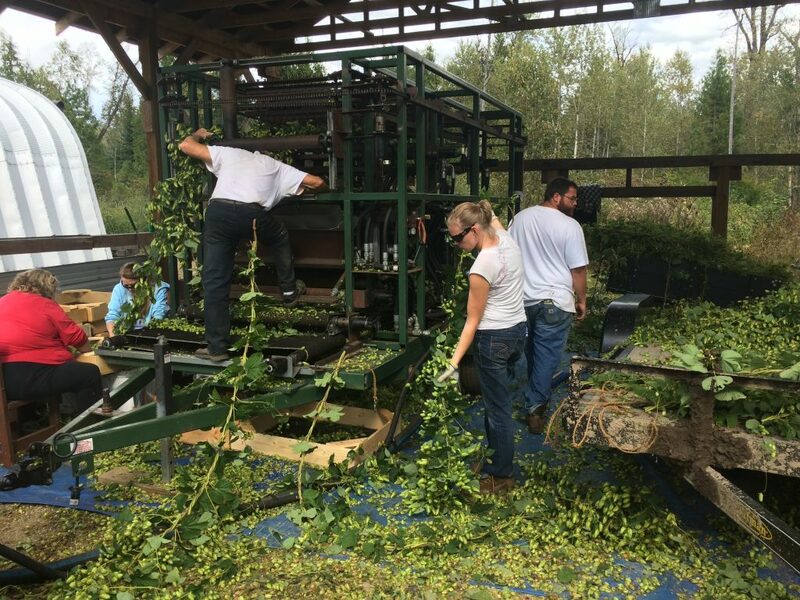 Actually picking the hop bines, was not so much fun. You might have noticed I’ve been calling them bines, not vines. Vines use tendrils, root protrusions and thorns to do their climbing. Bines on the other hand, use stiff hairs that grow along its stem to climb. These hairs are what slightly ruin harvest (only ever so slightly); they make a lot of cuts that sting like a nettle but without the lumps and they really really sting when you’re in the shower. It’s all worth bearing though, to have a fully-grown bush of cascade fall onto your face, and that aroma fill your nostrils, it’s an almost euphoric experience. Eventually, from having so many bushes fall on my face, my nose began producing hop pellets; it’s a unique and organic process that ensures you get the most out of a crop. Half way through harvest, Marten Brewery in Vernon called Rita requesting 20lbs of wet crystal and centennial hops to load into their hopweizen. Wet hopping is becoming more and more popular in Canada, so much so that The Alibi Room (a great bar in Vancouver, make a note in case you ever visit, it has a very similar vibe to North Bar and is definitely worth finding) -hosted a beer festival dedicated to wet hopped beers. (Wet hopping basically means hops straight from the bine and into the brew, no drying, no nothing. Fresh as daisies.) The next day we went out into the field and hand picked the whole 20lbs. Putting them through the harvester meant we would have lost some of the cones that the bines had produced, given that the bines were not very full, we had to savour every hop we could. By 1pm we had the hops picked, bagged and we drove them one hour over to Vernon to meet Joe, the head brewer, there, the hops went straight into the fermenter to juice up the brew! 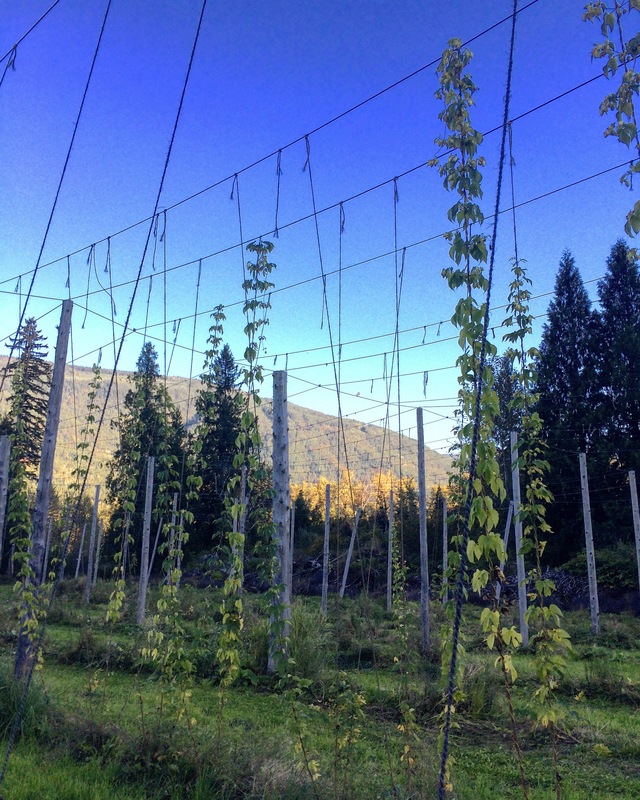 In total we harvested 375lbs of hops, most of which has gone over to Chilliwack Hop Farm, just outside of Vancouver to be boxed up and distributed across British Colombia. Eagle Valley remains in close contact with the local breweries and they always get first dibs on their produce. Mt. Begbie in Revelstoke brew an excellent Helles Lager and always take Eagle Valley’s crop of Hallertau to use in it. If you ever find yourself in BC, I recommend you find yourself a bottle. 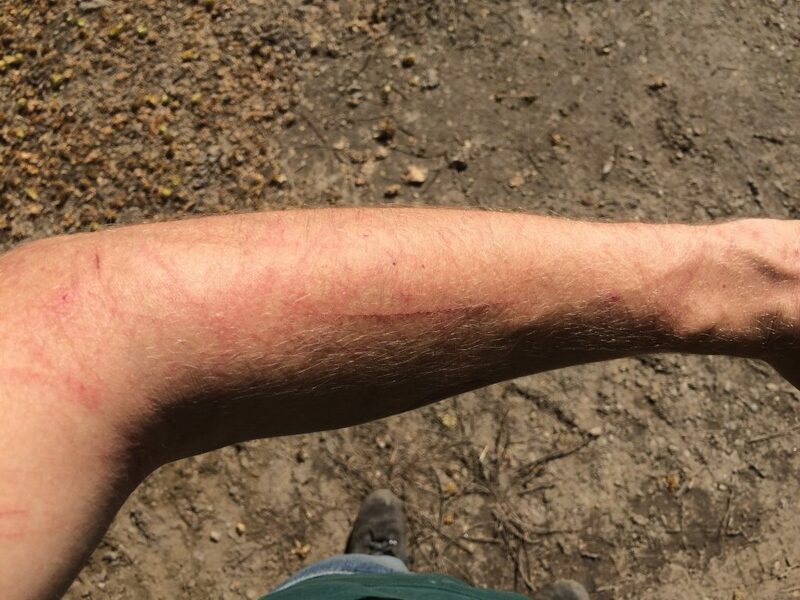 I had a mission to complete when I arrived at Eagle Valley Hops, it was risky and uncertain, but according to a brewers forum, very possible. I wanted to bring a little bit of Eagle Valley’s hop varieties back with me and do a hopped up brew with a Canadian twist. A way perhaps of giving a wave to our commonwealth friends from across the pond. I feel like they’re a little like that cousin you really get on with but never see. Why don’t we see more of Canada over here? -They have some damn good beer and everyone is really friendly (seriously, everyone was actually really friendly.) Sorry i’m getting all emotional thinking about everyone I met in Malakwa. * Slow motion memories of harvest, Avril Lavigne ‘When you’re gone plays’. * Any way *wipes tear away * It’s good news, I have succeeded in smuggling five suspicious looking silver vacuum packed bags full of organic green produce into the UK (it definitely feels like that should be a lot harder.) and a banging brew awaits!